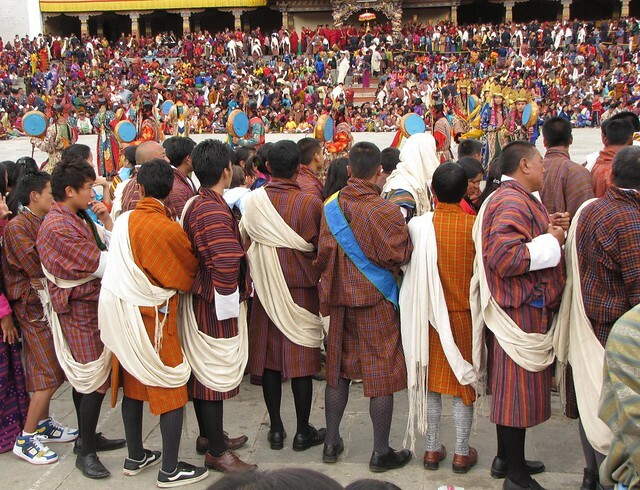 One of the most enjoyable activities at a tsechu (Bhutanese festival) is checking out what everyone's wearing. Women wear a layered silk blouse and jacket combo with an intricate, hand-woven kira worn pinafore-style or as a long skirt. Coral necklaces are piled on top. There are no limits or standards for matching colours or patterns so the effect of the dressed-up crowd can be quite remarkable. 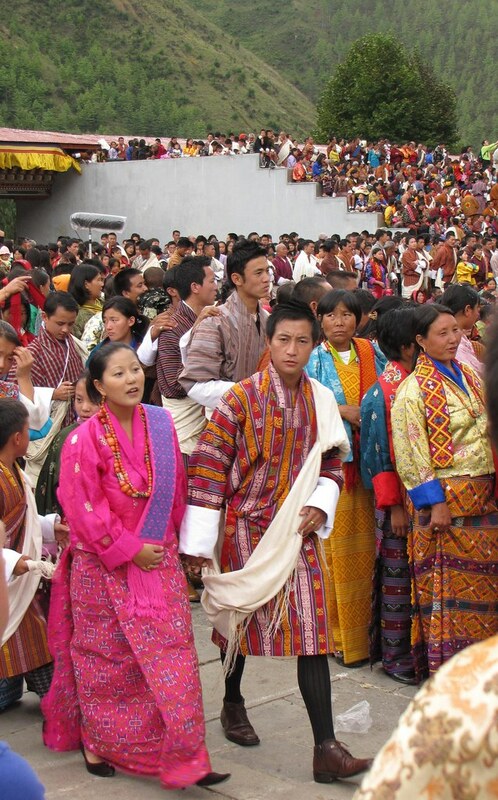 The men can turn up in ornate brocade or brightly woven ghos although the colour scheme does tend towards rusty reds and oranges. Some festival-goers really step up the style quotient. A hand-woven kira can cost hundreds of dollars, which would have cut deeply into my volunteer's budget so I bought a length of machine-woven fabric instead. Pink, blue and yellow are all colours I rarely wear but I picked these shades for this occasion. I was also lent a somewhat ill-fitting peach and yellow hand-woven kira. Since I attended four days of festivals, I wanted a little variety. 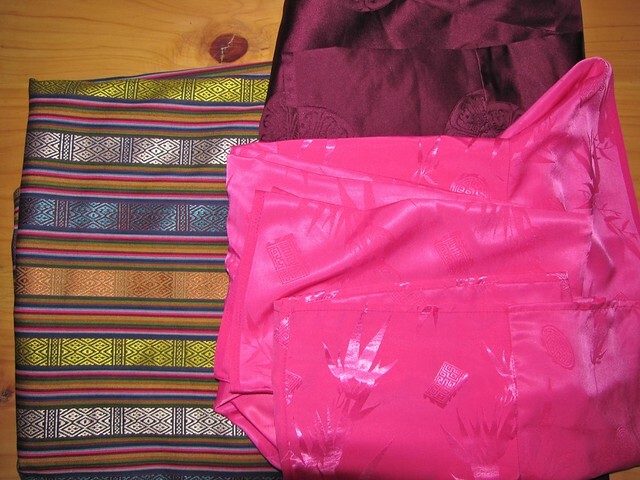 Here's my $15 full-length kira, a purple toego (silk jacket) and a pink wonju (silk blouse) which I wore to the Thimphu Dromchhe last Monday. To wrap the full kira, the top left corner is held at the back of the left shoulder then pulled around under the right arm to the front of the left shoulder. Next, the remaining fabric is folded to meet the front right shoulder, then the rest of the length is brought under the left arm to reach the right shoulder back. 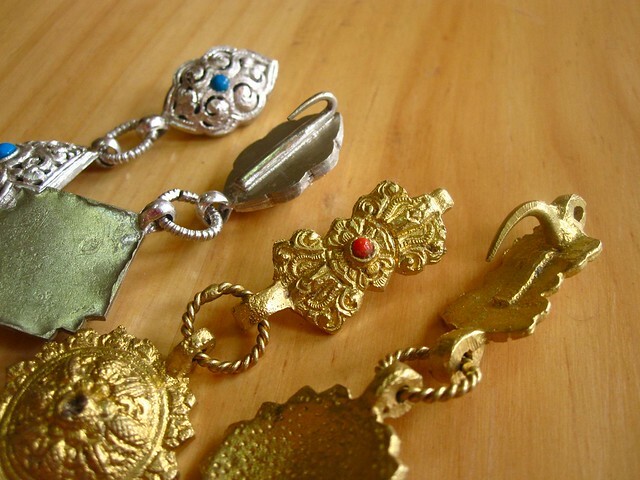 A full-length kira needs to be held up at the shoulders by way of koma, a pair of hooked brooches. The hooks are pulled through the upper edges of the fabric and they sit across each shoulder. Sometimes, the hooks work their way though the clothing and give shoulders a nasty jab. The silver koma here are mine while the gold plated pair is borrowed. The kira is cinched at the waist with a woven belt called a kera. I bought this cheap and simple blue, white and pink one last year as a souvenir. 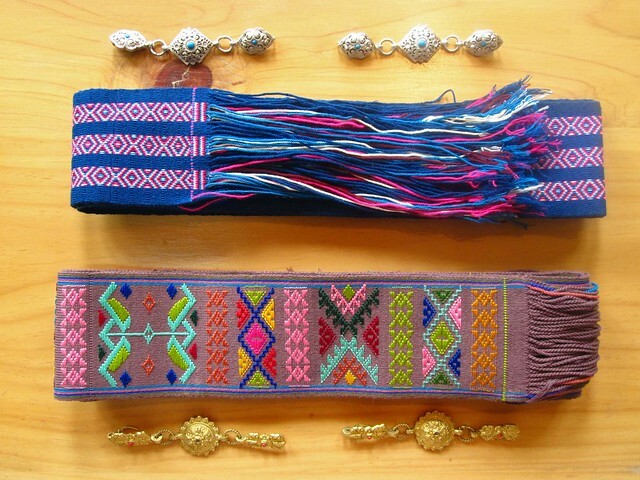 The fancy one with the woven motif was lent to me. Men also wear a kera to fit their ghos, although men's ones are narrower and simpler in design. Finally there's the rachu, a sort of sash or scarf which women are required to wear in formal settings. 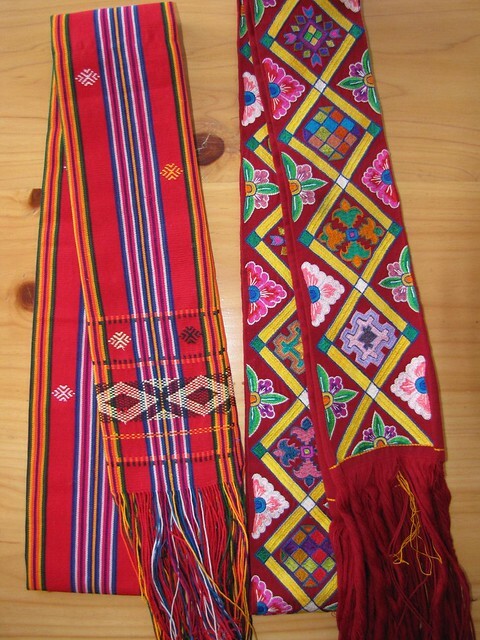 Rachu, worn over the left shoulder, are most often red or burgundy in colour although pink, purple or even green ones are available. I bought the cheapest possible rachu, the machine-woven one to the left, but I was spared having to wear it when I was lent the embroidered one on the right as well as a purple floral one. 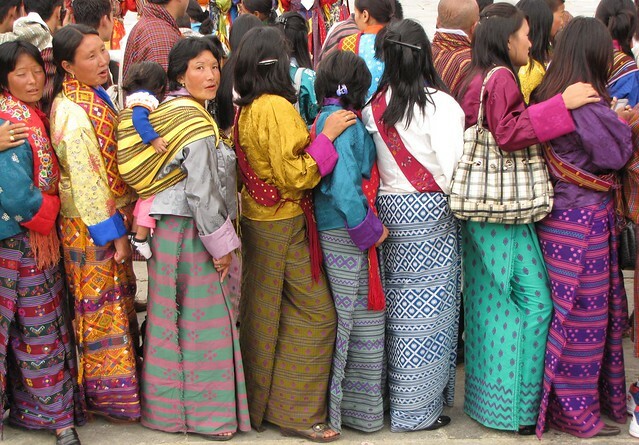 I saw a few women wearing a purple rachu with an endless knot motif which I am totally coveting. The male equivalent is the kabney, a long, fringed scarf worn over one shoulder which can be seen in the second photo. I think Saturday's outfit was the best although I usually avoid yellow. Also, weirdly, I had no trouble wrapping the kira myself on the first three days but Sunday's attempt was a big failure! 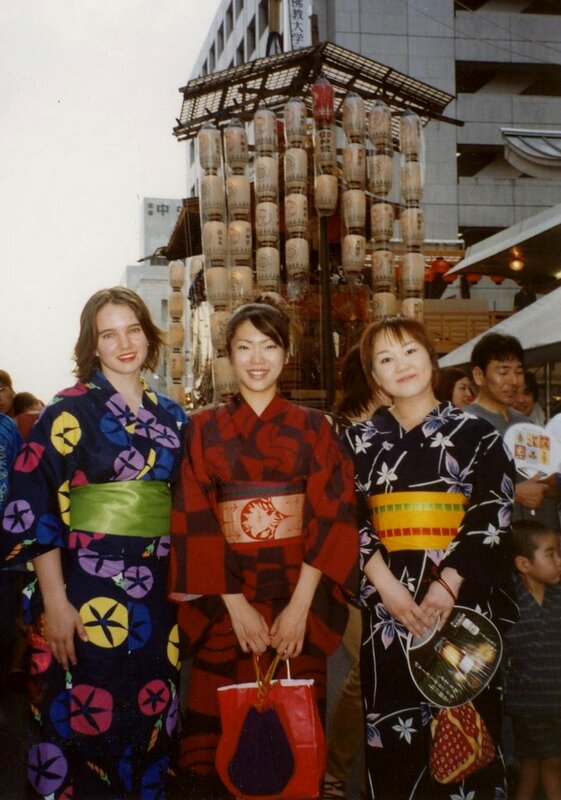 As a fan of traditional clothing (eg. and eg. 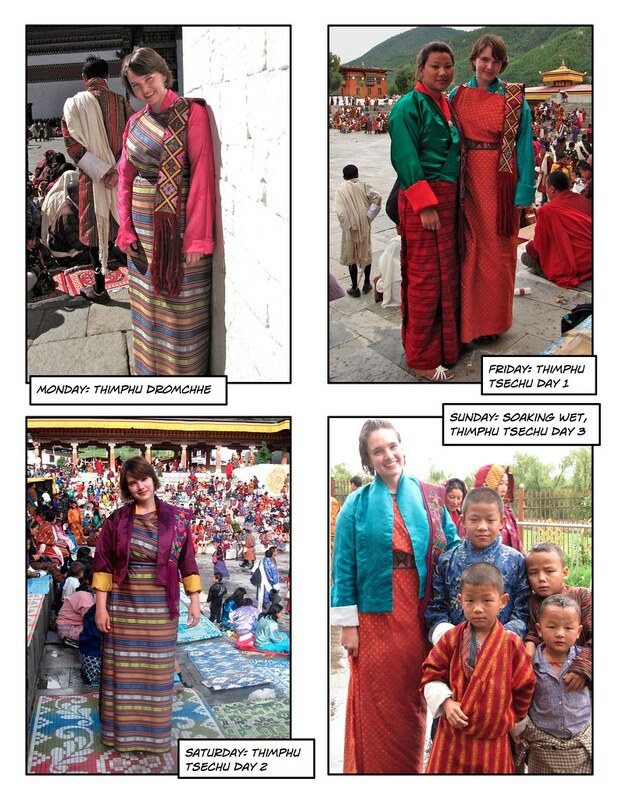 ), I've had a lot of fun playing with colours and patterns and also learning about Bhutanese fashion.